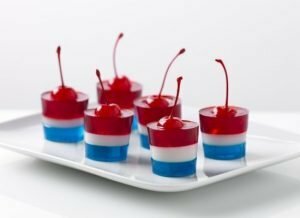 How to make perfect Jello Shots? 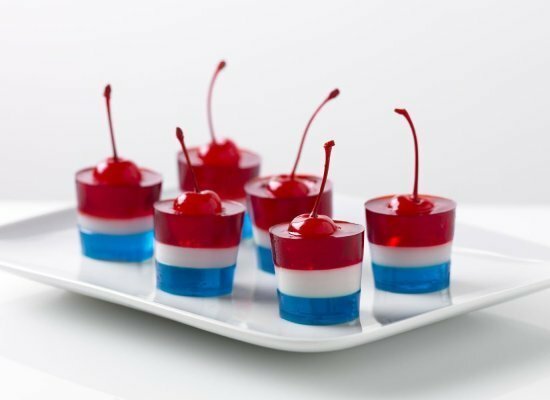 These yummy looking recipe, “Firecracker” jello shots might be just the ticket. Grab a box of Berry Blue, Strawberry and Unflavored gelatin and get to work. You’ll also need fresh cherries with stems, sugar, milk, vanilla, cooking spray and shot glasses to make this delicious dessert which is sure to be a winner among family and friends. Add 2/3 cup boiling water to berry blue gelatin mix in small bowl; stir 2 min. until completely dissolved. Repeat with strawberry jello mix. Cool. Meanwhile, sprinkle unflavored gelatine over 1/4 cup milk in medium bowl; let stand 5 min. 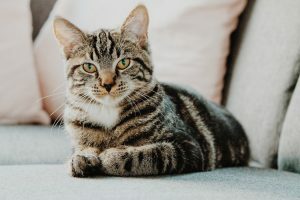 Bring remaining milk to boil in saucepan. Remove from heat; stir in sugar and vanilla. Add to plain gelatine mixture; stir until gelatine is completely dissolved. Cool 10 min. Cover with cherry gelatin, adding about 2 tsp. to each cup. Refrigerate 2 hours or until jello is firm. Remove from cups before serving. For adults only, enjoy this jello shots with vodka recipe. Prepare as directed, only using just 1 cup of water and dissolving each of the berry and cherry gelatin mixes in 1/2 cup boiling water. Stir 1/4 cup vodka into each flavor of gelatin, then continue as directed. This reminded me of the popsicle with the same colors. I actually made this one and while it didnt turn out like the photograph it did have those 3 layers of jello!! Kinda fun, and easy to make. I did this one with different colors. I only used two because that’s what I had.